All Posts Tagged With: "No7"
Loving the No7 Early Defence GLOW ACTIVATING Serum. I just started to use it this week. I like the packaging because it is travel friendly. The consistency is more of a light cream/gel white in color (not clear like water/oil). It’s easily absorbed to skin. It has a scent but not too overpowering which is a plus. Works great as a primer under makeup for a smooth and glow-ey application. Product claims: Contains both Vitamin C and Salicylic Acid, and delivers a healthy glow in just 7 days! Boosts skin’s defences against pollution. Suitable for sensitive skin. Clears and refines pores. 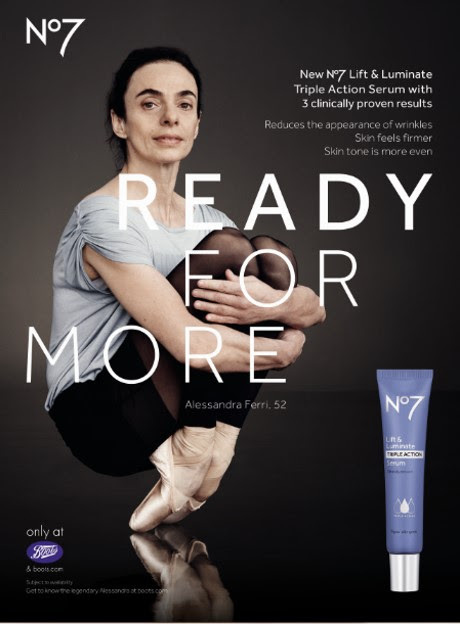 Introducing the new No7 READY FOR MORE campaign featuring world-renowned ballet dancer Alessandra Ferri. This campaign is in celebration of No7’s biggest, most powerful and effective anti-aging launch for 2017 – Lift & Luminate TRIPLE ACTION Serum (it launched in the UK last spring and had a waitlist of 12,000!). This is No7’s first serum to deliver three clinically proven anti-aging results: wrinkles are reduced in appearance, skin is noticeably firmer and skin tone is more even.